They give you the message everywhere they can. You cannot miss it. And at the same time they can say it is just entertainment. 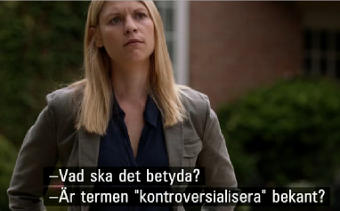 In Season 3, Episode 4 of "Homeland," titled "Game On". "Carrie" Mathison, (Claire Danes) meets Leland Bennett (Martin Donovan), a lawyer who gives her following arguments. Bennett: You know how this works. You said so yourself. Bennett: Are you familiar with the term Controvercialize? Bennett: That’s what they are doing to you. They turn you into a story. … You are a liability to a lot of people that have a lot to lose. So far, they have kept your name out of the press. But how long will you think that’s gonna last? And what happens then? I tell you what. You are destroyed. … And in a six month or a year if you have not killed yourself by then. They’ll do it for you. You are naive to think they will not. You will slip in the shower. They will force feed you Lithium until the heart stops, and they’ll hang you in a doorknob and call it suicide. That is how they produce Scapegoats and make them disappears in one way or the other. It is not the recently disclosed total surveillance that is interesting. The real thing is the answer to: Why seams any argument valid that is based on mistrust of the citizens? This question and its answer highlight what is deemed to be a taboo – in a world where it is proclaimed that we are able to talk openly about everything. It is political incorrect and a taboo to ask fundamental questions that reveal what the political élite and the academic tradition will not talk about. Two examples, of such questions, are: What precisely is democracy? and How is it possible to create knowledge in any science? You simply cannot give a concrete answer to these and many other fundamental questions within the Western tradition of thought. The Western tradition of thought, was constructed to protect that Might Makes Right/Might Is Right. Consequently, it is only possibly is to obey. Therefore, any argument that you are a threat to law and order is valid. Or to be even more precise any argument that proves that you are wrong, if you put the established order to question, is valid. Thus, you cannot object to: total surveillance. Of course you can try to find any argument against it. But, all your arguments will be futile, lame and lack any value or power. The substance of the word Subject, or Subjectivity, underlines this simple truth. Please, listen carefully to Snowden, listen to what he really says in the first great interview. Down below are some of the best. "… But over time that awareness of wrongdoing sort of builds up and you feel compelled to talk about. And the more you talk about the more you're ignored. The more you're told its not a problem until eventually you realize that these things need to be determined by the public and not by somebody who was simply hired by the government. ..."
"… NSA and intelligence community in general is focused on getting intelligence wherever it can by any means possible. It believes, on the grounds of sort of a self-certification, that they serve the national interest. ..."
"… I think that the public is owed an explanation of the motivations behind the people who make these disclosures that are outside of the democratic model. ..."
"… if you realize that that's the world you helped create and it's gonna get worse with the next generation and the next generation who extend the capabilities of this sort of architecture of oppression, you realize that you might be willing to accept any risk and it doesn't matter what the outcome is so long as the public gets to make their own decisions about how that's applied. …"
NSA 'exceeded Orwell's imagination' - Guardian editor Alan Rusbridger says depth of NSA surveillance programs greatly exceeds anything the 1984 author could have imagined, The Guardian, 230913. Freedom of Information, A British newspaper wants to take its aggressive investigations global, but money is running out, by Ken Auletta, The New Yorker, 071013.